I’ve started a website and facebook page that features new and experimental music in the Greater Louisville and Kentuckiana region. Sometimes it’s difficult knowing what is actually happening around you unless you have some place that aggregates all the relevant activity, events, and people involved in it. I had once tried this in Indianapolis while I was more active in that scene and had a website which also served as the digital presence for an experimental music festival, INDYtron, I had started there in 2003. I let that domain go but have since archived some of that at at lonely facebook page. I also have an archival facebook space for the Chello Shed (most active from 1996 to 2000) which was a space and events entity I used to produce a several dozens of events and performances. That one has much more content, as I’ve slowly started digitizing programs, images, and audio/video for it. 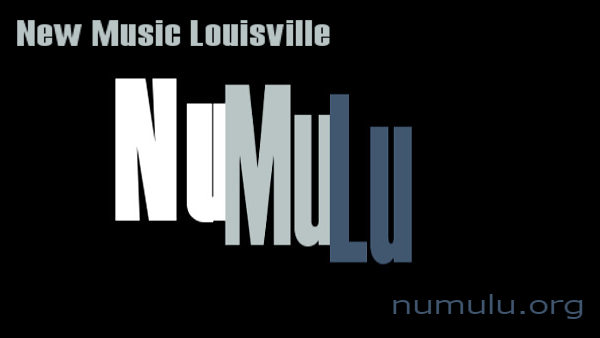 With NuMuLu, I hope to take all that experience (there was tons of frustration involved with previous efforts) and tenacity (I dug up some of the most wonderful gems relating to experimental activity in the Indianapolis area, for example) and use the web spaces to let folks know what’s happeneing in this area–as well as what has happened in the area since the Louisville Orchestra had some international fame while it was doing the First Edition Records and the University of Louisville is host to one of the biggest prizes for composition, the Grawemeyer Award for Music Composition. Now that I run my own New Music group, the Mothership Ensemble, in the area as well as a more experimental project, Camera Lucida, which uses interactive video in collaboration with dancers and movement artists, I figured it was time to bring all of this history together and show it side by side with such things as the Louisville Experimental Festival, the UofL New Music Festival, the New Music label at IU Southeast, New Dynamic Records, and other New Music and improvisation groups like Orchestra Enigamatic and Bone Crusher –with luck start getting some momentum for all of us! For the longest time I’ve wanted to start a Contemporary Music Ensemble and that dream has come to fruition. While working on a number of occasions with a local composer, Rachel Short (a recent graduate of IUS), we’ve pulled together some resources and folks (as haphazardly as that might have happened) and concocted the Mothership Ensemble (the name which, as she said, “chose itself”). I’ve talked with a number of local composers and musicians when i moved back to the Louisville Metro area about the idea of starting a New Music group, and ideas flew back and forth, but nothing really solidified. Over the past year or so I’ve been Rachel’s works for various events and as well as her senior recital. One piece of hers, Wormhole: Caesura (for voice and string trio), we’ve performed a number of times with pretty much the same line-up (with me on voice/cello).